ZICO Law Vietnam brings on board local boutique law firm, Garnet Law. The addition will expand the firm’s corporate and commercial sector expertise and accommodate an increase in demand from domestic and international clients. Established in 2007, Garnet Law was run by Managing Partner, Phuc Nguyen and his team of five associates. With over twenty years of local experience, Phuc has advised both local and foreign clients in a raft of notable real estate, corporate, and commercial matters. The merger will support ZICO Law Vietnam’s operational efficiency and delivery of high value corporate commercial work to domestic and international clients. Established in 2011, ZICO Law Vietnam operates in Hanoi and Ho Chi Minh City as a full-service corporate law firm. In 2014, ZICO Law Vietnam opened its office in Hanoi and welcomed partner Phuong Nguyen to the team to lead its banking and finance practice. “I have a tremendous amount of respect for Phuc, who has practised in Vietnam for twenty years. I am honoured that he would choose to transition his practice to ZICO Law in this time of rapid expansion across our network. He and his team bring to ZICO Law exactly what we look for – an understanding of local business needs with an underlying regional perspective,” said ZICO Law Vietnam’s managing partner, David Lim. 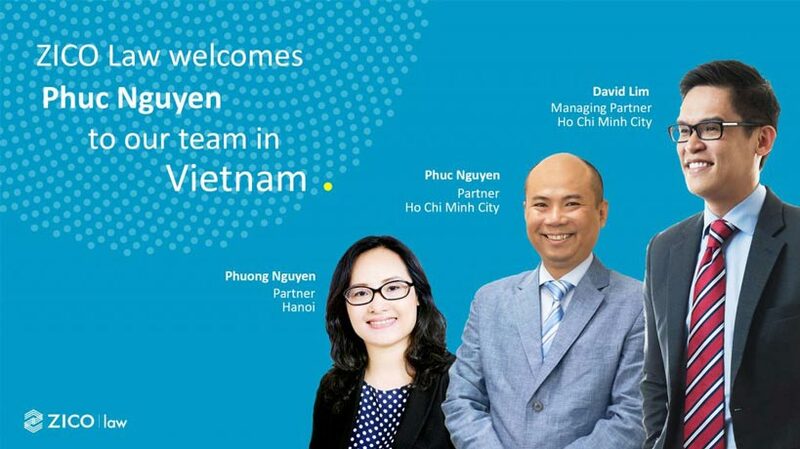 Phuc Nguyen joins ZICO Law Vietnam as Partner in the Ho Chi Minh City office. For more information regarding ZICO Law in Vietnam and the ZICO Law network, click here.